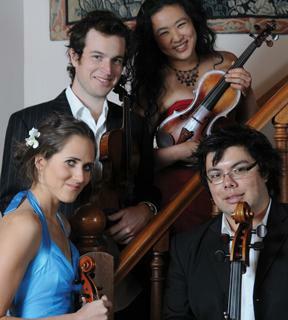 Formed in 2006, Hamer Quartet gave its first public concert in 2007 in Melbourne to critical acclaim. In 2009 Hamer Quartet competed in the Asia-Pacific Chamber Music Competition and was awarded the Audience Prize for Quartets, First Place for String Quartets, and Musica Viva’s Tony Berg Award for Most Outstanding Australian Ensemble. Hamer Quartet were Artists in Residence at Monash University in 2007, and have performed extensively in Australia and Europe. They have performed as part of the Melbourne University and the Australian National Academy of Music Lunchtime Concert Series, the finale of the 2007 Melba Festival, and the Ripponlea Twilight Concert Series. They were also the winners of the ANAM Chamber Music Competition in 2007. In 2010 the quartet were fellows at ANAM, and in residency at the University of Melbourne’s Trinity College, Parkville. The quartet has toured Queensland as part of the Australian Festival of Chamber Music’s Outback Tour, collaborating with renowned didgeridoo player William Barton. They have also performed regional concerts for Chamber Music Australia. In 2008, Hamer Quartet performed at the International Musician’s Seminar in Prussia Cove, Cornwall in the UK, where they undertook extensive studies with Andras Keller. They also appeared at the Norwich & Norfolk Chamber Music Festival. In 2009 the quartet performed at the opening of the Elisabeth Murdoch Hall, Melbourne, gave a public master class with the Arditti Quartet, appeared on television for the Australian Broadcasting Corporation, and gave concerts at the Australian National Academy of Music, the Geelong Chamber Music Society, Elgee Park Winery, Yarra Valley’s Melba Festival, Cope Williams Winery and performances on the Mornington Peninsula. Hamer Quartet would like to acknowledge Trinity College, Parkville, for their support.